I lost my mother on September 4, 1980. 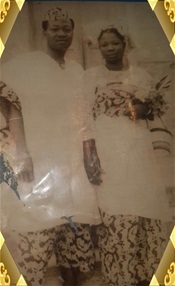 Therefore it is 35 years today since my dearly beloved mother, MRS MILDRED ABEBI OLOGUN, departed this world. Mum, we miss you and love you dearly. You cross my mind everyday. I never stop wishing you were here to see your children grow up and to hug your eight beautiful grandchildren. If only wishes were horses, eh....! They say God knows best, but for us who love and need you in our lives, we are still inconsolable. I cannot help thinking how differently our lives (your children) would have turned out if you lived to raise us. It would definitely be much better than it is now, no matter what. It would be incomparable! We are doing ok and although there is room for improvement, I am sure you are proud of us and hopefully we can continue to make you proud. We just thank God for giving us a mother still renowned for her kindness, compassion and generosity by everyone who knew her. One of the best midwives Ososo ever had at the time. Always available to help any pregnant woman both in and out of hospital and at any time. We are so so proud that you were our mum. Continue to rest in the bosom of the Lord. All our love, from your children, Sunny, Jude, Evelyn and me. Awesome mum. The very best in this side of the world. I was little when you left us but I will forever be grateful that you were my mum. Thanks for the piece.